When the San Diego Padres played the Atlanta Braves on Tuesday, the game was far from exciting to some people. Padres fans watched the Braves completely pummel the home team, winning 14-1. But if things were seeming predictable, that changed when a foul ball flew into the stands. 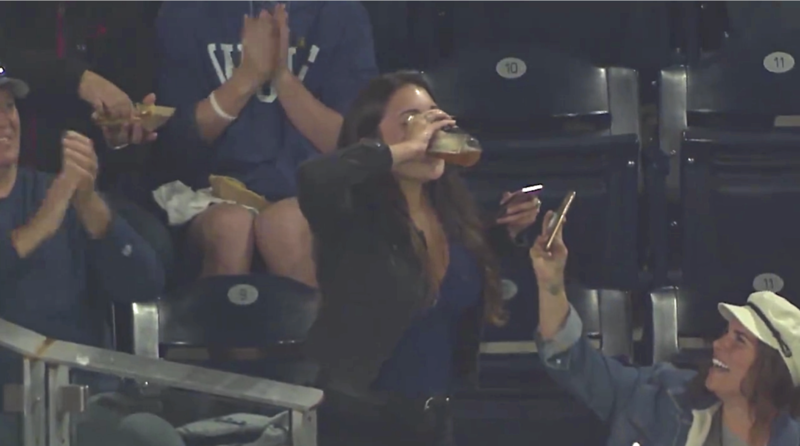 The Braves' Ender Inciarte hit the foul high into the stands, where a woman named Gabby DiMarco sat, casually sipping her beer, CBS Sports reports. She was shocked when the ball flew her way, and she caught it right in her beer cup. But that amazing feat wasn't the end of it. DiMarco stood up and held the cup high above her head in triumph, laughing at the random lucky catch. She drew huge applause from the stands, but what got her even more recognition was what she did next. She proceeded to chug the entire beer -- with the ball still in it. DiMarco's friends and fellow spectators whipped out their cellphones to film the celebration. Videos of her baseball chug went viral, with thousands retweeting Petco Park's tweet. People were in awe with DiMarco's catching -- and drinking -- talents, with one person using the hashtag "Somebody marry this girl now." When she finished downing the beer, DiMarco proudly held up her cup. It was completely empty except for the MLB game ball she got to take home. The game itself might not have been so memorable, but this baseball -- and beer -- fan is.